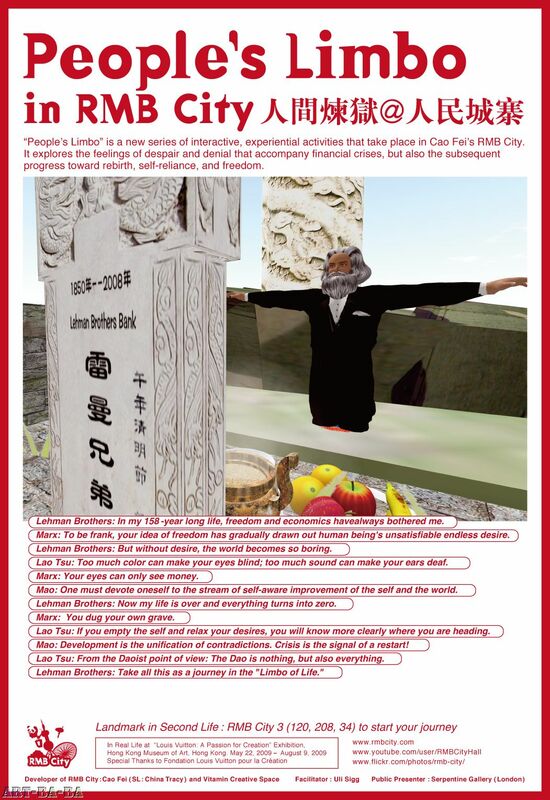 "People's Limbo" is a new series of interactive, experiential activities that take place in Cao Fei’s RMB City, a fantastical community in the vast virtual world of Second Life. A reaction to the global economic crisis, the project is an exploration of the feelings of despair, denial, and loss of control that accompany financial catastrophe, as well as the simultaneous potential for progress toward rebirth, self-reliance, and freedom. In the words of Lao Tsu, "If you empty the self and relax your desires, you will know more clearly where you are heading." Beginning May 22, 2009, ten videos of the ten new People's Limbo activities will be displayed in the Hong Kong Museum of Art, as part of the "Louis Vuitton: Passion for Creation" group exhibition. The videos offer a Real Life (RL) audience a unique view of the essence of the "People's Limbo" experience, while Second Life (SL) users can experience the work firsthand. Via avatars, people may participate interactively in each of the ten activities, as if playing a virtual art game. Some of these games are competitive and reflect the influence of past economic realities, like one in which the visitor is thrown into the middle of a dense bubble of chaotic, bouncing balls, only to find it increasingly difficult to maneuver her way out, mirroring the quick loss of control that occurs as an economic bubble builds (and quickly collapses). Others, like a sustainable community garden, are meditative, and represent idealized visions of the future. Perhaps the penultimate People's Limbo experience is to visit the foot massage parlor staffed by Karl Marx, Mao Zedong, a fictional Lehman Brothers executive, and Lao Tze. In their imagined dialogue, Marx's avatar quips to Mr. Lehman Brothers: "To be frank, your idea of freedom has gradually drawn out human beings’ unsatisfiable endless desire", to which the executive replies "But without desire, the world becomes so boring". Their philosophical examination of all of these ideas continue until the executive dispenses with a final piece of advice: "Take all this as a journey in the 'Limbo of Life'". RMB City is a virtual art community in the online world of Second Life, initiated by Beijing artist Cao Fei (SL: China Tracy) as a public platform for creativity. Officially launched in late 2008, it will continue to grow and change over its two-year run, with the participation and support of leading international art institutions and networks. The city is a laboratory for experiments in art, design, architecture, literature, cinema, politics, economy, society, and beyond. Known for her multimedia installations and videos, Cao Fei is acknowledged as one of the key young artists emerging from Mainland China. She mixes social commentary, popular aesthetics, Surrealism, and documentary conventions in her films and installations. Her works comment on the rapid and chaotic changes that are occurring in all facets of Chinese society. Second Life was conceived as an online platform for participants to create a parallel reality in which to live out their dreams, and 14 million people worldwide have registered since it launched in 2003. Each user is represented by an ‘avatar’, a digital figure that they can customize and control. As well as visiting existing environments and communicating with other inhabitants, participants can purchase land, design buildings, develop businesses and trade in a marketplace of their choice. In only the second year of racing, the Southern California-based American Interbanc/Cannondale mountain bike team is being led Ben Sonntag, who recently signed for the squad Bissell Cycling Jersey . "I have some big races cycling jersey on my radar for 2013, and so far we're off to a great start, sitting third overall in the standings and a finishing fourth in the" said Sonntag. "I bike wear am excited about joining the American Interbanc/Cannondale team and even more excited to be back racing on Cannondale bicycles again. I've raced Cannondales for the majority of my mountain biking career." Sonntag, who lives in Durango, has Garmin Cycling Jersey groomed himself over the bike jersey years into one of the top endurance stage racers in North America. An diverse and talented German, Sonntag's resume includes wins at La Ruta de los Conquistadores and the Breck Epic bike clothing . "We are excited to have a rider of Ben's Cycling clothing caliber flying the American Interbanc / Cannondale team colors, and showcasing the performance of Cycling Sets Cannondale bicycles," said American Interbanc/Cannondale team manager Jon Hornbeck. Clothing shoes market have special wash suede shoes shoe powder to sell. After dirty suede leather shoes, if dry clean is indelible. After scrubbing can scrub with wet cloth, first dry in ventilation, shady and cool place. Leather surface seems dry dry, reoccupy bristle brush dips in some suede powder, shoes on the shoe brush, shoe suede will be puffed up. After a blow dry, suede can recover. Winter is coming, it is estimated that each mm has more than a pair of suede leather shoes. How to maintain is a headache thing. This is I see in a place on this one of the most radical version, hope can help to everybody. Material: brush, shoe stretcher, detergents, renovation, sponge, mothballs. 3. Use special brush to brush. Pay attention to the main processing copper wire surface besmirch the heavier parts and polished by parts. Brush with rubber face first in one direction, use side seam. Besmirch place emphasis on looped knead, knead it with copper wire. 4. Use wet sponge to clean again, wet shoes. Purpose is mainly dealing with water soluble substances. 5. Shake well cleaner spray on the surface. With rubber brush brush back and forth again and again to make both sides fiber stains are removed, dirty bubble with a wet sponge blot. 6. Air is ten minutes, etc. Hair is a bit dry, and some wet brush with rubber surface in one direction, make hair scattered, finishing. 7. Air is half an hour, after upper dry shoes in newspaper to protect, 15 cm away from the shoes uniform spray update agent. Update agent containing light agent, colloid (enhanced adhesion of other material), pigment, solvent, can dissolve the mixture), etc. Main aim of the spray update agent is complementary. Black shoes to wear for a long time is easy to reverse, it is best to ecru update agent. After 8. Dry it with a rubber brush again, make the same color. 9. Finally put desiccant collection.